(This is part of my Project: Artist with a Day Job series!) Sometimes when you work a day job, life can be summed up as “go go go go go.” Your brain is addicted to getting things done, checking things off the list. As an executive assistant, I proclaim sweet victory every time I mark an item on my list with a big capital-lettered DONE. But when the time comes to be at the easel, it can be downright impossible to turn off this frenetic mindset. And THAT is a hindrance, since art-making is most joyful and fruitful when done while calmly focused on present moment. It can be an even bigger hindrance when you only have, say, 30 minutes in the morning to paint before heading out the door, or 5 minutes with your sketchbook on your commute. The heart starts racing and the mind screams – “START. Get something done NOW, you only have a few mintues!” Yeesh. The key is to relish the time you have, instead of getting worried about it. And don’t get worried over the finished product either. You are not here to make a masterpiece. You are here to paint. Plain and simple. Because “making a masterpiece” would just be another bullet on your overwhelming to-do list. That’s not what painting is. Remember that if you’re feeling flustered at the easel. 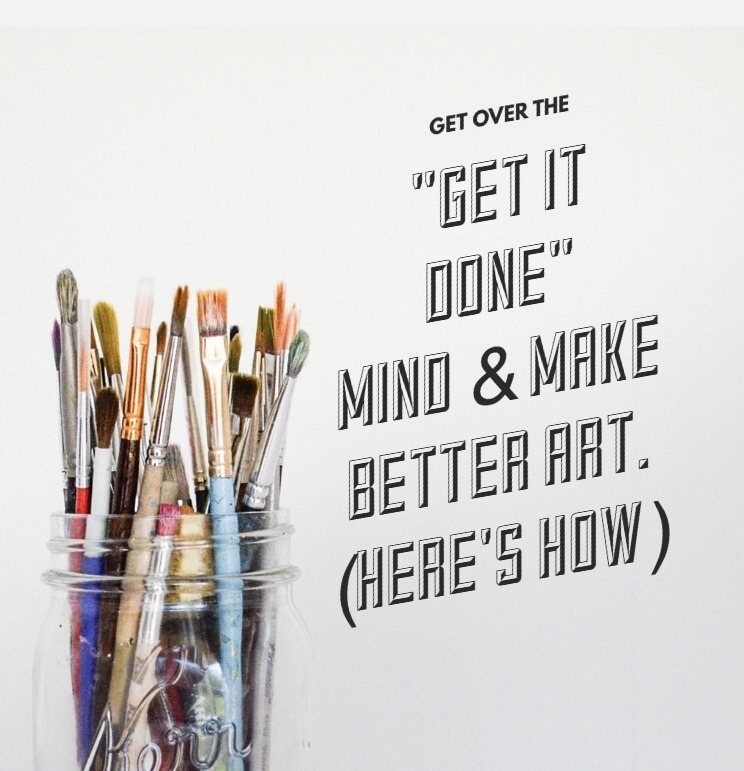 Here is a hard and fast tactic that I use to overcome the crazy “get it done” mindset. 1. Before I start painting (even if I have a mere 10 minutes), I take a couple of slow deep breaths. 2. Then, before brush sinks into paint, I consciously tell myself what a lovely gift it is that I have these minutes to relish in making marks on a canvas. Even if I don’t really FEEL that gratitude right then, saying it to myself helps a little bit. Having gratitude for the time (rather than anxiety that I need to use the time sensibly and get something done), puts my mind a little bit at ease and in a better place to make art.